Assumedly, I am a girl. But, when it comes to sports I know why my uncle is so happy to have me around at all times when watching sports. I don't know everything but I sure know enough to be welcomed to any sports event with boys. In fact, during college season I am normally the only lady present. I learned from listening and being a fan, but what if you need a crash course? Forget the chocolate-covered strawberry footballs – the best thing you can bring to a Super Bowl party is your arsenal of football knowledge. And since women represent over 45 percent of the NFL’s viewing audience, a new book from Vanessa-Franchesca "VF" Castro The Modern Girls’ Guide to the Gridiron needs to be in your arsenal. Her goal is to make it easier for women and girls to understand and relate to the sport they love. The 49th Super Bowl will take place on February 1. To celebrate, VF is kicking off a giveaway and blog tour for The Modern Girls’ Guide to the Gridiron, a comprehensive guide to the game from a woman’s point of view, written by sports journalist Vanessa-Franchesca “VF” Castro. 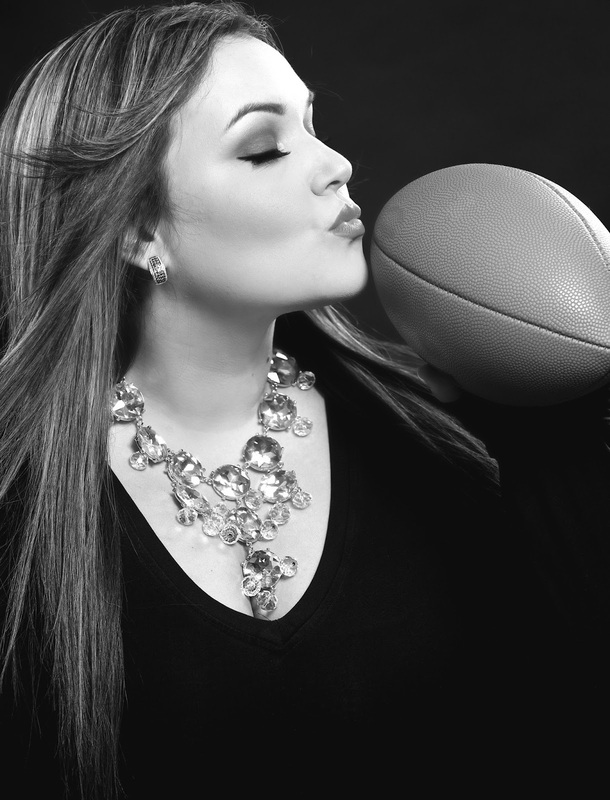 Formerly a makeup artist, Vanessa also puts together Game Day Looks – both beauty and fashion – on her blog. 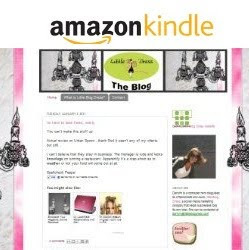 Vanessa took some time our of her busy schedule to give you some ideas on what to wear for the big game! Seattle Seahawks: For the first look, I styled a pair of skinny jeans (which are a closet staple), and a neon green embellished blouse by 3:1 Phillip Lim, followed by a pair of navy blue espadrilles from Michael Kors. The second look is a little more fashion forward, but it's still a classic style. I paired a gorgeous blue ribbed knit sweater by Yves Saint Laurent Vintage with a playful bright green skater skirt by Go Jane. And for accessories, I paired a sparkly bib necklace by BaubleBar, with grey booties from Steve Madden, and then a matching grey Debutante clutch by my favorite, Henri Bendel. 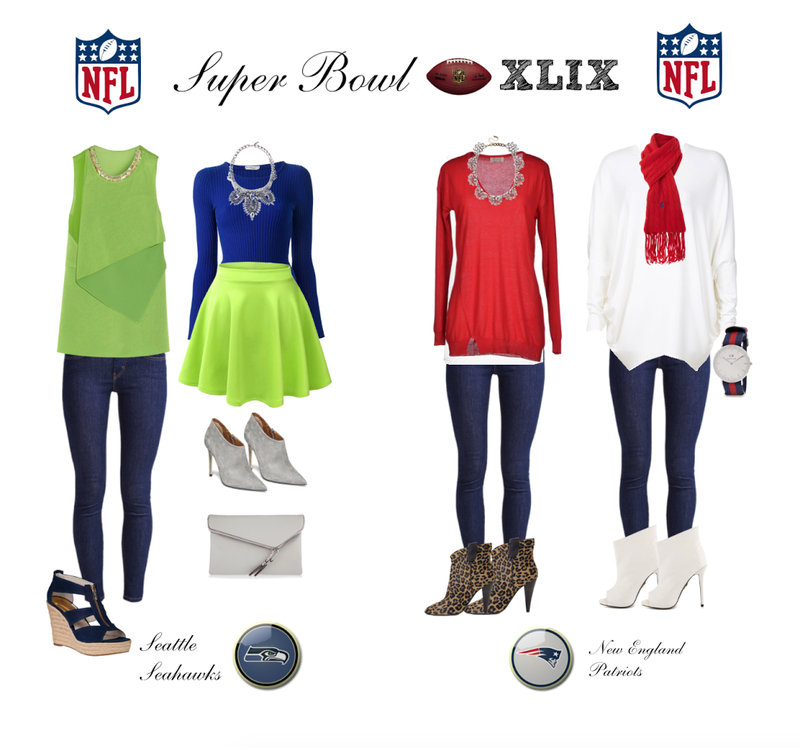 New England Patriots: For the first look, I paired basic skinny jeans with a white tank top, and a red sweater by KAOS, with leopard booties by Ella Moss (similar), and a necklace by BaubleBar. For the second look, I styled the same skinny jeans with this white dolman sleeve sweater by Helmut Lang, with white booties (similar), and accessorized with a red Ralph Lauren scarf, and this "timeless" nautical-style watch by Daniel Wellington -- a perfect nod to New England style. If you go with the basic colors of each franchise, your rooting interests will be easily differentiated, but the goal is to have fun -- both with your fashion choices, and during the game itself.